Hello and welcome. I’m Jen Farrant. I help you develop and share the story of who you are and what you do: strategically, visually, and in words. I primarily work in the arts and cultural sector, but love working with anyone who has a mission which is important to them. I work with you to develop and deliver strategic plans at a range of levels, from marketing, business development or even running a programme. I also provide research and evaluation services. Finding the right way to talk about your company or organisation can make a huge difference to what you are able to achieve. I work with you to develop your story and share it in the right way. This could be: ghost writing, ebooks, marketing collateral, blog posts etc. The right visual images are vital to communicate what you do – especially at the end of projects or events. Working together we create a brief to ensure you have the right images to demonstrate your objectives or to show what you to do in a creative way. I also have my own practice, primarily focused around Thurrock. My logo is the representation of my initials in braille, a creative communication solution to an issue. Purple is my favourite colour, so much so that my wedding dress was purple, so it makes sense that my business carries that colour too. I’d love to! Let’s chat by Skype or phone to see how we can work together to share your story. 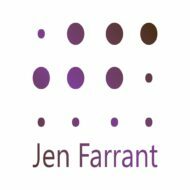 Please email jen AT jenfarrant DOT com, with some times you are available. I am generally available Tuesday- Thursday for calls.